restnrileks : ): Weblog Popular 1Malaysia :Does Your Blog Have What It Takes To Win RM1000? Weblog Popular 1Malaysia :Does Your Blog Have What It Takes To Win RM1000? Does Your Blog Have What It Takes To Win RM1500? (aha, i ll get more into this later) and sorry, this is such a lengthy post. Opps!! Alright, Does Your Blog Have What It Takes To Win RM1o00? Ohh the Weblog Popular 1Malaysia !! Check out the above pic. Awesome ya? Frankly, i think this is the biggest cash prizes ever offered by a blog owner in Malaysia. Plus, you got 7 chances of winning either rm1500, rm1000, rm500 and 4xrm250 (ahhhh i am already drooling over these). Thanks to Denaihati for having such contest (phewww saya tahu contest Weblog Popular 1Malaysia dari blog DenaiHati la - ishhh terpaksa pakai ayat camni jugak ka? ko kejam arr). Owh look, i post DenaiHati's link below. So.. check it out. According to Denai Hati " Denaihati ingin mencari Weblog Popular 1Malaysia untuk membantu menambah ilmu menguruskan blog dengan lebih baik daripada weblog yang hebat yang mungkin belum terjumpa dalam jutaan weblog di Malaysia. Untuk mencari Weblog Popular 1Malaysia aku perlukan bantuan teman-teman. Hadiah yang menarik disediakan kepada teman-teman yang membantu aku mencari Weblog Popular 1Malaysia." And all prizes are made possible by Saudacare and Anisha Online Mall. Ohh do check Saudacare, you may fancy some of their products - You may try their products to complete your wholesomeness intimate experience. Whoaho!! 2. Put up the "Weblog Popular 1 Malaysia" as an image link. 4. Link back to the sponsors (Terima Kasih yer penaja-penaja yang murah hati) and links should be updated should new sponsors participated. 5. Leave a comment on DenaiHati mentioning about your post. Whoaho!! That aint hard. Contest is from 1/7/2009 and ends at 12.00am on 30/9/2009. Contest is open to Malaysians who run either Bahasa Malaysia or English Blog/s. There are two ways you can actually win the Awesome prizes, either by nominating a blog or by being the most referred blog linking back to DenaiHati. Best try to do both. Ohoho. Bloggers, KOMON, i do urge you to "war-warkan berita yang baik ini". Nominate your creative friends, nominate your cam-whoring friends, nominate blogs that touch, inspire and motivate you for the WeBlog Popular 1 Malaysia contest? Just nominate a blog Darn it!! (owhh rizal, such barbaric word...!!) I am sure if you can squeeze one post and one pictorial link bar of this contest if you can post those Nuffnang and Advertlets "gajet gajet" on your blog /s. Moreover, this contest will give those other blogs unlike Kenny Sia, a chance to be famous ( erkk ala Akademi Fantasia ka?) Come on, this contest, needs at least a minimum of 100 nominated blogs. So spread the words bloggers and start nominating. I hope you do hop to DenaiHati to read more about this contest. Oh gosh!! now i am making this into one lengthy post. One nomination per blog?, this is really hard since i love all my readers and without readers, RestnRileks is just an empty lifeless online page. But after much consideration, I am nominating (drum rolls please.... drummmmm!! drum!! drumm!!) this one kreatif blogger known as Emila Yusof of Emila's Illustrated Blog ( a full time blogger and a mother). Check out Kak Emi ya. Here is one of her many creatif works. Awesome!! I would have never dared to try Illustration Friday and do some illos if not because of Kak Emi. Thanks Kak Emi, because of you, Abang and adik was born. Hoho!! It is a feast of creative wonders to just visit Kak Emi,s. 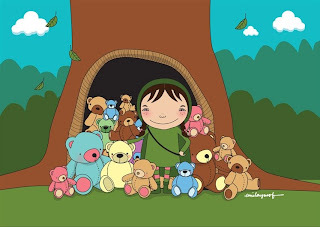 Her creative illos are simple, clean, funny, witty and whimsical that they appeal to all readers. Check out her artworks. First hop to her site, i thought i was landing on some international blog due to her creative illos. Her illos are somewhat different that most malaysian creative works that i have seen. Owh she now does have an online lil'shop selling her creative werks plus she is on Etsy, and Zazzle too. Best of all, she is "peramah". Well, enough talk, just hop on and see for yourself. If you like her blog, and feels that she deserve to be in the running, please nominate her as well. Well, i guess, i have made this into one leeengggggthy post. Phew!! And, I shall end now. Hehe. Happy Weekend, Have a great Day Every Day and Happy Blogging Ya. First three commentators of Restnrileks will be given a linky love each. Congrats Monica . Woot! woot!!. Congrats Shemah for 1st time securing linky love here at RestnRileks. Nazshemah is the owner of these three blogs. Just Press Play, Never Enough Stuff and My Sweet Escape. Check em out will ya. Congrats Marzie!!. Marzie is the owner of these three blogs. Hope on to hers. Btw, she is an awesome copywriter and works from home. 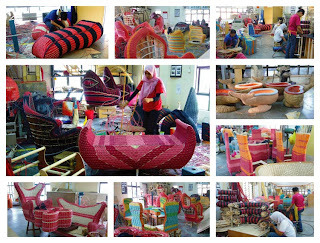 eeee.. lawalah the rattan furniture! i want!!! yay for emila!!! she definitely deserves to be nominated!! now who shall i nominate?? hmmmm... LOL! your chop is now tgh dalam prosess.. and whoaho!! verified... hehe. So post mana kali ni shemah? Badabing De BomB!! your chop is now verified!! Thank you.. thank you. Tunggu laa Konvo tahun ni.. Masa tuu kami jual murah, macam tahun lepas.. keke sebab nak clearkan store. Ehhh shemah can nominate shemah what, since you have more than one blog. Rules tak kata owner but blog kan? Recent blog:=- Friday Fill-Ins: Casino games, Envy, Movie! yeah mon.. nominate one of your friends or just go and nominate yourself jugak. Whoaho!! ooohhh.. umm.. can i have Just Press Play, tak? ohh really?? woww.. i've got 4 blogs ni.. hahahaha can i do seperate entries and nominate seperate blogs?? hahahahaha.. macam carry own basket plak kan? Alright oer carry own basket. Rizal pun sama, tgk tuuu siap letak my illo nak tumpang populariti kak emila laa tuu konon-konon. Walhal jauh macam panggang dengan api. Kekeke. kekeke... mekasih... ni musti kes chop nak cepat sampai tak tunggu CL dulu..
hahaha.. aper2 pun tahniah jadi yang ke 3. Ada problem marzie, if i put smiley, Cl will not work. And yang hari tuu bincang dalam YM, kena tick the other way. I think my code semua dah celaru2 even sebelum letak plug-in. Perfect!! Nominate a blog or just round up all your friends to nominate for you laaa.. hehe. Write or promo post will put you in the running as well. whoaho!! Yay CL is up and running! Bestnye 1000 RM! your lucky day. First timer plus mood bolehkan nak masuk berapa pun. No problem at all Shemah. Recent blog:=- Sketch Book and Rattan Interactive. wuahhh.. thank you so much!! bestnyaaaa!!! :) :) Congrats to you too, first timer ngechoper!! LOL! betul tu. I would have nominated few others too should the rules allow so. wahhhh... now i can see so many update. haha. masa tu saya ada check but belum update. haha. Recent blog:=- art in progress + happy birthday to Michael Nobb. But then since i am not into monetizing, apa salahnya. aha... tuu laaa pupu. masa tuu RnR dalam hiatus. Yup, Kak Emila deserved to be nominated pun. Have a great day kat Korea sana yer.. Recent blog:=- Ahhh...I am cONfused!! Major in Illustration seems to suit you. Tapi tak per, nanti habis belajar boleh kosentrasi kat children's illo. salam..apa kabar bro? sihat ker...suka la rattan furniture..biasa jual kat mana? bro terima kasih join the contest ..insyallah ramai lagi akan join. Khabar baik. Oh, rotan tu tak jual, sebab tu semua hasil pelajar. Kalau jual pun jual murah kira nak bersihkan store untuk ruang. Selalu jual murah2 masa konvo. InsyaALLAH, harap ramai lagi yang akan turut serta. Recent blog:=- An Award, Rattan Sketch, Friendship Poem and Illos. Welcome here, any friends of Marzie's circle of friends are most welcome too here on Restnrileks. I ll be visiting yours often as now, you are officially my rival in CHOPping game. LoL!! Rizal... I'm not Malaysian.. cannot join ke?? sedihnya !!! sori la.. yang tu rizal tak pasti laa pulak. but then kalau your blog under hubby, mungkin boleh kan? Maybe satu cara boleh tanya denai hati. Ok.. nanti I tanya eh..